Yokogawa Electric Corporation (TOKYO:6841) announces that its subsidiary, Yokogawa United Kingdom Ltd., has received an order from the British Pipeline Agency Limited (BPA), the UK’s leading provider of engineering and operational services to the oil and gas pipeline sector, to supply a management and control system for a major multi-product fuel pipeline system. This project will replace BPA’s existing pipeline management and supervisory control and data acquisition (SCADA) systems. This order is for Yokogawa’s Enterprise Pipeline Management Solution (EPMS), which will manage functions such as delivery scheduling and oil storage, and the FAST/TOOLS SCADA software, which will monitor and control the oil pipelines and related equipment such as compressors. 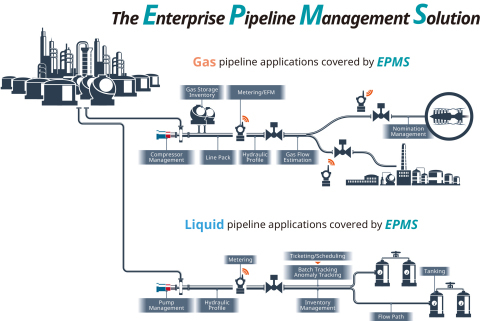 The EPMS supplements a basic pipeline management system with specific gas and liquid applications that enable a pipeline operator to manage delivery contracts and associated logistics in a time and energy efficient manner. With the SCADA system covering monitoring and control, the EPMS will integrate the management of the SCADA data. Yokogawa United Kingdom Ltd. will be responsible for the engineering, installation, and commissioning of these systems. Yokogawa Europe Solutions B.V., which has a wealth of oil and gas pipeline project experience, will provide support. Delivery of these systems will be completed by March 2018. In accordance with its Transformation 2017 mid-term business plan, Yokogawa targets the entire energy supply chain. The company is strengthening its efforts to drive up sales by providing solutions for oil and gas pipelines and other midstream applications. Encouraged by its success in winning this order, Yokogawa plans to expand its control business in the midstream applications segment. BPA LTD is owned by Shell and BP and they operate the UKOP and WLWG pipeline systems, which are owned by a consortium of partners. The pipelines managed by BPA have been in operation since 1969. A strategic UK supply asset, the UKOP and WLWG systems comprise three integrated pipelines (Thames - Mersey, West London, Walton - Gatwick) that are over 650 km in length. They supply multiple types of fuel products from refineries on the Rivers Thames and Mersey to inland distribution terminals and meet over 50% of the jet fuel needs at London’s Heathrow and Gatwick airports.